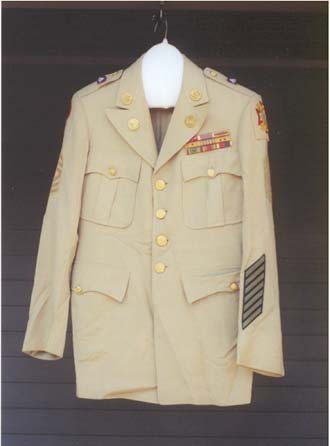 Martin Schweitzer's WWII Army Jacket from the Morrison County Historical Society's collections, photo by Mary Warner, 2002. Military uniforms, for the most part, have not held much more than a general interest for me…until now. They are fascinating! All those medals and ribbons and patches are teeming with threads of identity, keys to unlocking the story of a soldier’s career. Even the uniforms themselves have secrets to tell. This United States Army enlisted man’s service uniform pictured belonged to Martin Schweitzer, a resident of Little Falls, Minnesota, who served as a First Sergeant in the Army Corps of Engineers during World War II. Martin was born in St. Louis, Missouri, on July 5, 1915. He entered the Army in August 1941 and served until 1950. In the spring of that year, Martin moved to Little Falls where he married Cecelia (“Cele”) Karnowski and began working at Camp Ripley. Martin Schweitzer died on September 10, 1969. Martin’s uniform displays his rank, unit and branch of service. The medals and other insignia decorating the jacket suggest a distinguished career. Brass buttons on the collar and lapels indicate that he was a member of the Fifth Army and served as a Combat Engineer. Two enameled pins located on the shoulders of the jacket display the symbol for the Fifth Army. The design of this symbol combines a red background with a blue onion-domed structure and a white number “5” that is set inside the legs of a white letter “A.” The shoulder sleeve patch on the jacket indicates Martin’s unit, which was the 7th division. The symbol for the 7th division is a red circle in which are placed two black triangles, one on top of the other, so that their tips are touching. On the upper-left breast of the jacket are nine ribbon bars, each representing a medal or commendation that Martin received during the course of his military career. Two of the medals are the Bronze Star and the Purple Heart. The Bronze Star was a common medal of WWII. It was awarded for distinguished heroism or meritorious achievement. The Purple Heart was originally awarded for performance of any singularly meritorious act of extraordinary fidelity or essential service. It was based on a decoration established by George Washington and was authorized on February 22, 1932, the 200th anniversary of Washington’s birth. After September 19, 1943, the Purple Heart was given to all personnel killed or wounded by enemy action. Three of the ribbon bars represent campaign medals, each indicting an area where Martin served during WWII. Martin served in the American theater, the Asiatic-Pacific theater and the European-African-Middle Eastern theater. He certainly did a lot of traveling in a few short years. Three of the ribbons have campaign stars, indicating his participation in a major engagement. The multi-colored WWII Victory Medal is intriguing because its authorization date, July 6, 1945, places it before Japan’s surrender on September 2, 1945, and after the conclusion of the war in Europe on May 8, 1945. This particular style of uniform was generally issued on discharge and served mainly as a dress uniform during WWII. The jacket, which is known as the 1926 Model Service Coat, was not practical for wearing in the field. Separate uniforms were developed for use in combat. Prior to WWII, service uniforms were worn in the field. The uniform is constructed of wool gabardine, a good choice of material for military uniforms. Extremely durable, wool wears well and is excellent for tailoring. I am eagerly awaiting my next opportunity to research the other military uniforms in the MCHS collections. What threads of identity do they hold? What secrets are they waiting to tell? The adventure continues! The uniform you show here is it the true military dress uniform. My father was wearing one in his military picture that was green and looked like the fabric was wool. Is the green wool uniform a field uniform? Thanks for the question, Diane. I am not an expert on military uniforms but olive drab (aka green) wool is what seems to have typically been used for field uniforms during World War II. Hope that helps! I have my father’s World War II uniform that I would like to preserve. Can you tell me the best way to do this? One simple way would be to purchase an archival box to store the uniform. You can use clean cotton sheets between the layers or purchase acid-free tissue paper. Try to limit the number of folds when packing the uniform. You can use crumpled up tissue paper or batting to soften any folds where they are needed. If the uniform is in fairly good condition and storage space is an issue, you could hang it on padded hangers. Either make your own garment bag out of clean cotton or purchase a garment bag that breathes. Be careful not to encapsulate the uniform entirely in plastic. At first glance this uniform appears to unfortunately be a Veterans of Foreign Wars Tunic (VFW), and not a real WW2 Uniform Tunic. The photo presented clearly shows that the shoulder sleeve insignia on the upper left sleeve is not a military unit insignia, but it is the insignia for the Veterans of Foreign Wars national organization. I say this from 35+ years of personally collecting and preserving both WW1 & WW2 uniforms, and as spending 7-years as an executive director of a historical museum in the state of Iowa. I would need to see a closeup photo of a button on the tunic, and view the tunic in person to make certain whether or not this is a summer or tropical weight WW2 tunic, or if it is a post-WW2 era tunic made up for VFW members to wear. Thanks for the information, Alan. We will check into it and see what we can find. MCHS staff.